Seaford Town Council is pleased to announce that its Annual Grants Scheme is now open! In the 2018/19 scheme the Council supported local organisations with grants totalling £23,000. There are certain criteria that must be met to be eligible for a community grant, these are set out in the Council’s Grants Policy which is available to download from this page. There are two types of grants available, small grants of up to £500 or larger grants over £500, up to a maximum of £3,000. Terms and conditions do apply. Application forms are now available to download from this page. Application forms and supporting documents should be returned to Lucy Clark, Finance Manager no later than midday on Friday 7th June 2019 when the application process closes. Please click here to download the grants policy. Please click here to download the grants submission notice. Please click here to download a small grants application form. Please click here to download a large grants application form. 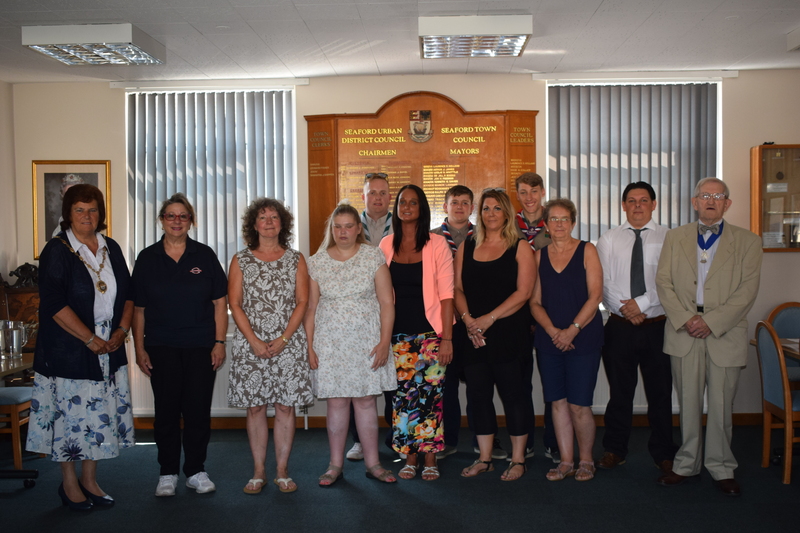 Mayor of Seaford, Councillor Linda Wallraven (far left), and Chair of Finance & General Purposes, Councillor Mark Brown (far right), with the recipients of the 2018/19 large grants: Seaford Bonfire Society, SeeAbility, Seaford Lifeguards, Seaford Community Events Committee, Waves Seaford Ltd, and Care for the Carers.